In honor of my 100th blog post and my friend Teresa's birthday yesterday I made these yummy treats. I found this no-bake recipe on Pinterest and decided to give it a try. The recipe comes from The Girl Who Ate Everything Blog but I modified it just a little. Beat together butter and sugar using an electric mixer until combined. Add cake mix, flour, salt, and vanilla and mix thoroughly. Add 3 Tablespoons of milk or more if needed to make a dough consistency. Mix in sprinkles by hand. Roll dough into one inch balls and place on a parchment or wax paper lined cookie sheet. Chill balls in the refrigerator for 15 minutes to firm up. While dough balls are chilling, melt almond bark in the microwave in 30 second intervals until melted. Stir between intervals. Once melted, quickly stir in the Crisco until incorporated completely. Using a fork, dip truffles into almond bark and shake of excess bark by tapping the bottom of the fork on the side of your bowl. 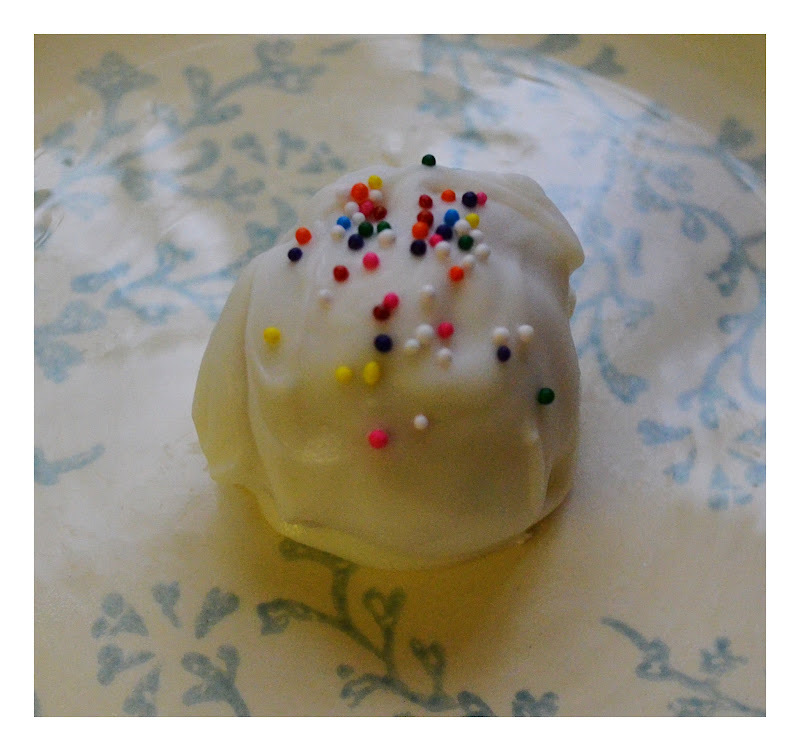 Place truffle back on the cookie sheet and top with sprinkles. Repeat with remaining balls until finished. I found that dipping the balls was by far the hardest part. Make sure you chill them. I didn't see that part of the recipe when I was making them. I think that would have helped a lot. Chill cake batter truffles in the refrigerator until serving. Makes around 24-30 truffles. Thank you, Thank you! I love this! I have printed this for my memory box and my recipe box! Too cool!